When I first met Eric Serritella, he was vice president of an advertising agency. We had worked together for several years when he told me he was leaving his 16-year career to start a life as a full-time artist. I didn't know much about his motivation but admired his decision. I knew that for a while he had a peripatetic life making mugs and selling them at street fairs. He then faded into pleasant memory. Last year, I saw some extraordinary Trompe l’Oeil ceramics, teapots and other work that looked as if they had been made out of birch logs. The artist was Eric Serritella, the same Eric Serritella I had known back when he wore suits. His work is now in the collections of the Metropolitan Museum of Art and the Renwick Gallery of the Smithsonian American Art Museum in Washington, D.C., among other important collections. In April, he gave a James Renwick Alliance Distinguished Artist Series Artist Talk at the Renwick. Serritella’s path from executive to distinguished artist has been as direct as I would have expected from the detail oriented, perfectionist account executive. What it was that inspired him was a mystery to me until we reconnected and began talking. He had taken a pottery class when he was working in advertising and found it was “a natural click,” he says. 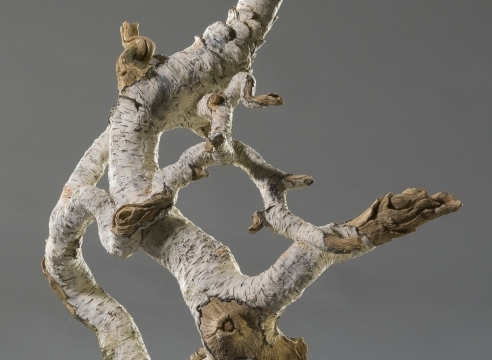 “I think it was the texture and sensuality and grounding nature of clay that captured me. I had tried watercolor and had done photography but I really wanted a hands-on experience and clay was the first applied arts medium that I connected with. I finished the six-week class and went back for another session." He lived near Cornell University, which hosted a series of workshops by Ah Leon, one of Taiwan’s most distinguished ceramic artists. Leon works in the Chinese tradition making Trompe l’Oeil teapots and objects from the purple zisha clay of Yixing. The two became friends and when Serritella asked Leon about the next steps in his career, the master replied, “Eric, you need to make better pots!” He invited him to Taiwan to work with four masters. He studied there for five months and, several years later, returned for a monthlong intensive with Leon himself. He learned in the Asian way—by copying the master. When returning home, Serritella resolved to “set myself free.” He experienced the 500-year-old teapot-making tradition in China and realized that his own evolution was to handle it at his own pace. He began to make teapots in the Trompe l’Oeil tradition but in 2007 chose birch trees, which figure prominently into his own life and aren’t found in China. “That started me on my own path. I was finding my niche in the Trompe l’Oeil world. I was no longer practicing a technique. I was making things,” he explains. Walking softly, Serritella experiences nature with an intimacy few have experienced. It animates who he is and appears in subtle nuances in the forming and carving of his work. Serritella’s mastery of technique allows him the freedom to push the limits of his medium. As he explores the negative space that gives form to the positive space of his work, he recalls the negative space surrounding the sumi-e ink brushstrokes of Chinese calligraphy. As in Asian art, Serritella’s art is of the moment. In the moment, he celebrates the profundity of nature in its imperfection and the interconnectedness of all things. His work opens a portal for others to experience nature in a richer way.